The first image in Krzysztof Kieslowski’s Blind Chance (1981) remains unexplained until the final image. My first encounter with the work of Krzysztof Kieslowski was The Double Life of Veronique (1991), his first feature since the collapse of Communism. I was enthralled by both its narrative – or narratives: it depicts the parallel or alternate lives of a single soul born into two possible existences, one in France and the other in Poland – and by its formal qualities. Stylistically, it embodied those two possibilities as distinct emotional and psychological experiences, a single character shaped in strikingly different ways by divergent social and political environments. The films which followed – the Three Colours trilogy – became increasingly abstract as they dug deeper into their characters’ internal states. Their subject was less the shaping of character by political environments and more the effects of individual experience and the influence of coincidence and arbitrary events on identity. The arbitrary, impersonal qualities of fate were a central theme of these later films, but Kieslowski had begun as a realist in the Communist Poland of the ’60s and ’70s. He began with documentaries, attempting to depict the reality of life in Poland, but in the mid-’70s he began to find this limiting and started to make fictional films, albeit with a strong documentary sensibility. Blind Chance (1981), Kieslowski’s fourth fictional feature, was – as Dennis Lim points out in his booklet essay accompanying Criterion’s new Blu-ray release – a key transitional work. This conceptually striking film begins with a close-up of a screaming man, the camera rapidly dollying in to be engulfed by his tortured mouth, an evocation of horror which is reinforced by the following image of a hallway seen in low angle past a woman’s injured leg, a bloody body being dragged away into the background. These disorienting images, and the elliptical moments which follow in a rapid, seemingly disconnected montage, will gradually reveal their meaning as the film progresses, but here at the start, the viewer is faced with a sense of chaos rooted in the possibility of physical violence and social disruption. They also declare forcefully that Blind Chance is a kind of puzzle which may or may not offer up a solution or solutions by the end of its three possible narratives. Made in a brief period of political relaxation in Poland, Blind Chance is openly critical of Communist society, but its real subject is the contingency of existence, a theme which could equally be applied to any culture. All three narrative possibilities offered to the film’s protagonist are finally pessimistic about the effects of chance on human choices, and the inevitability of entropy which in effect renders those choices ultimately meaningless. Despite its play with alternative realities, however, the film’s style is quite realistic, each of its storylines rooted in carefully observed social and psychological details, which both inform and constrain the three possible lives of its protagonist. Witek (Boguslaw Linda) is a medical student who has taken leave from his studies. That opening montage quickly sketches in key moments of his early life – his birth during a violent moment of political upheaval in the mid-’50s; the departure of a Jewish childhood friend who left Poland with his father during an increase in anti-Semitism in the late ’60s – before we meet him as an adult running to catch a train to Warsaw. Several seemingly minor details here produce radically different outcomes; he bumps into a woman, who drops some coins, one of which is picked up by man who uses it to buy a beer; Witek, running, is slightly delayed by these events and in the film’s first narrative he barely catches the already departing train. In this first possible future, he meets an older man on the train, Werner (Tadeusz Lomnicki), a loyal Communist who had been imprisoned during some earlier political upheaval. Under the influence of this father figure, Witek becomes a Party functionary. But when he reconnects with his first love Czuszka (Boguslawa Pawelec), he is exposed to the dissident movement she’s involved with. Witek, essentially decent, is perhaps too naive to understand the cynical opportunism underlying Party politics and he unthinkingly betrays Czuszka, leading to her arrest. In the second possibility, Witek misses his train and gets into a scuffle with a railway policeman, leading to a court appearance and a brief sentence. While doing his community service, he meets a radical and becomes involved with the dissidents, helping to print and disseminate subversive literature. He also becomes involved with Werka (Marzena Trybala), the married sister of that Jewish childhood friend, a relationship which suffers from missed connections and lost opportunities, which in turn lead the dissidents into believing that he has betrayed them. Finally, Witek again misses his train, but on the platform he bumps into a fellow student, Olga (Monika Gozdzik); here he returns to his medical studies, marries Olga, has a son, becomes a doctor … and deliberately avoids politics, living a decent life of service to his community. But even withdrawing from politics and the complications which arise from both conformity and dissidence, for Witek fate remains arbitrary and the film ends on a chilling note. In all three narratives, Witek is essentially the same decent person; contingency shapes his life in different ways, events presenting him with different choices, but without altering his nature. His decency can exist within any of the available social and political environments; Kieslowski is revealed here as a pessimistic humanist. In a sense, the specifics of the political background of the film – the history of Polish Communism and the emergence of the Soldarity movement – are irrelevant to Witek’s fate (in fact, there was apparently some consideration of remaking Blind Chance as an American film, in which inevitably those social and political details would be completely different). Although the film is full of life – Kieslowski uses a very fluid, generally hand-held camera, to give it a sense of energy and dynamism – at its core, it offers a dark vision of existence. The force of life tends inexorably towards entropy and death, even though it can be so vital on the way to that inevitable end. Although Blind Chance is as elaborately structured as the director’s later films, it feels more grounded in a time and place, the philosophical elements resting on a foundation of gritty realism which lingers from the earlier documentaries. Tonally, the film resembles The Decalogue more than it does the final four features, a moral enquiry into the choices people make within a specific social and political environment. 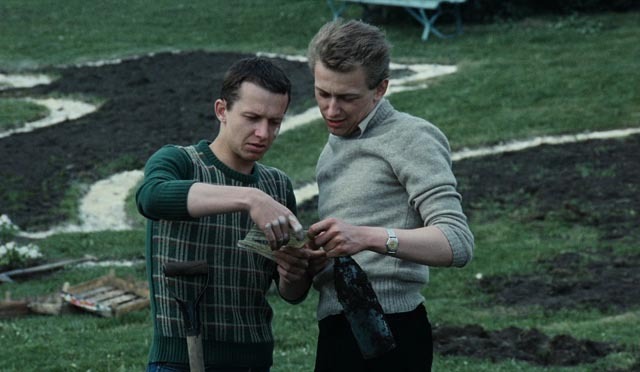 However, it does display one of the key characteristics of those later films, a rampant doubling of characters: in the first narrative, two older communists represent competing father figures; Witek had a twin brother who died during a traumatic birth, making his very existence contingent from the start; his Jewish friend who “escaped” to Denmark in 1968 represents a completely alternative course; the priest in the second narrative and the dean of the medical school in the third offer other alternative father figures who guide Witek into different paths; and then there is the tripling of the women he becomes involved with, each one providing an emotional possibility rooted in each particular narrative’s context. Blind Chance is one of Kieslowski’s richest films, both thematically and emotionally, but also one of his darkest in its depiction of a seemingly implacable universe. It’s interesting to note, however, that by the time of his final film, Three Colours: Red (1994), his pessimism seemed to have modulated somewhat, the potential for human contact offering at least the possibility of a little warmth in that otherwise chilly universe. Criterion’s new Blu-ray is drawn from a 4K scan of the original negative and a 35mm print. The image was restored in 2K and is very solid and stable, with rich if subdued colours. It has that gloomy look we often associate with films from Eastern Europe from that period, seeming to reflect the oppressive social situation under late Communism. Sound is clear, with naturalistic ambiances and depth in the musical score; dialogue is cleanly rendered. There are three supplements included on the disk, the first of which proves very useful in making the film more comprehensible for a non-Polish viewer. “Blind Chance” Unshelved (18:12) is an interview with Polish film critic Tadeusz Sobolewski, who fills in much of the political and historical background which a Polish viewer could be expected to be familiar with, but which is left largely unexplained for foreign viewers. Each of the three narratives is shaped by major events in the sometimes turbulent mid-century history of Poland. Filmmaker Agnieszka Holland (5:24) speaks of the underlying philosophical ideas of the film, which she feels are somewhat obscured by the social and political specificity of the film’s background; for her, Kieslowski’s ideas are more clearly stated in the later, more abstract films. Finally, Censored (9:47) highlights the nine cuts made by Polish censors in 1981, supposedly to soften the film’s criticism of Polish politics. These cuts were all restored in 1987 (except for one, which is represented in the film by a freeze frame and a title card accompanied by the original soundtrack), and it is this restored version of the film from which Criterion has mastered the disk. As is so often the case with censors’ cuts, in retrospect they seem rather ridiculous; these few very brief deletions actually do nothing to hide the film’s critical point of view, which is implicit throughout. The irony, of course, is that politics is essentially tangential to Kieslowski’s real concerns, which were more philosophical and existential. The booklet essay by Dennis Lim goes into some depth about Kieslowski’s films in general and the position of Blind Chance within that body of work. This entry was posted in Review and tagged Blu-Ray, Criterion, Directors, Politics, Restored Films. Bookmark the permalink.